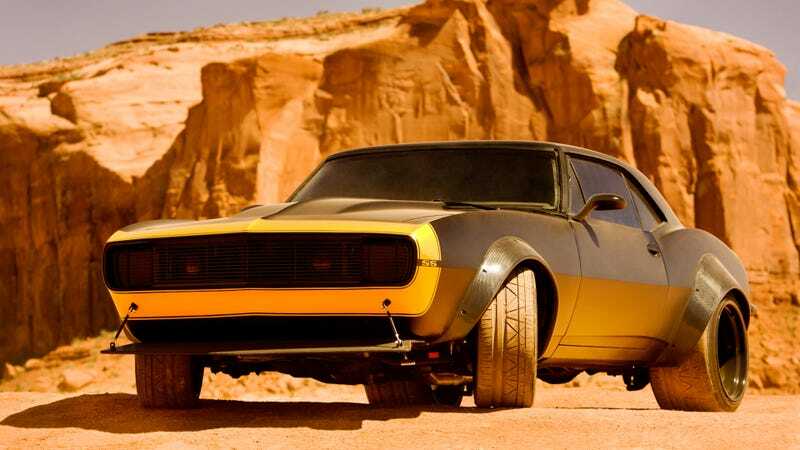 Despite building what is unquestionably the ugliest C7 Corvette Stingray in the world, Transformers 4 successfully made a pretty-looking Bumblebee out of a 1967 Camaro. I myself am in the minority believing that early second-generation Camaros look ten thousand times better than 1967-1969 Camaros, but I will admit that this version of Bumblebee looks pretty great. Is it better than the old '77 Bumblebee? That's hard to say. The fender flares are sweet, the deep-dish wheels looks great, and the yellow nose stripe is much cooler than any traditional racing stripe or hockey stick side stripe could've been. Here's that shot again, in giganto-size. Nice work, Michael Bay. Nice work.